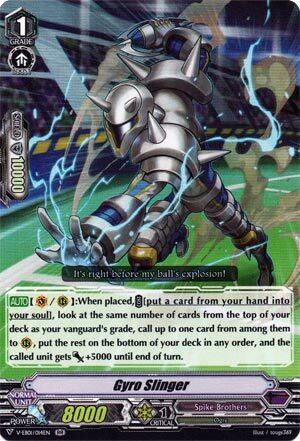 [AUTO](VC/RC):When placed, COST [put a card from your hand into your soul], look at the same number of cards from the top of your deck as your vanguard’s grade, call up to one card from among them to (RC), put the rest on the bottom of your deck in any order, and the called unit gets [Power]+5000 until end of turn. So we have here a means to fill a field to…actually, why would that even be worth it, aside from the free soul? Sure you get more choice the higher the grade of the Vanguard, and if you went second you could top-deck into a good attacker, but you’re looking for high quality calls here. It’s a +0 wash that’s only useful Mid Game when fields should look decently full. Not a card to spam or use carelessly.